Dale Neuman was born and raised in Elyria, Ohio. He earned degrees in political science from Kenyon College and Northwestern University. 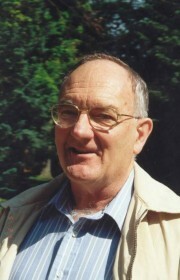 Dale taught at Northwestern and the University of Rochester before moving to the University of Missouri-Kansas City in 1966. He began to write his poetry after retiring in 2000. Returning to UMKC part-time in 2005, he now heads its Harry S Truman Center for Governmental Affairs and edits a newsletter. Poetry, his most recent endeavor, fits nicely with his interest in photography as Reflections and Observations combine both interests. 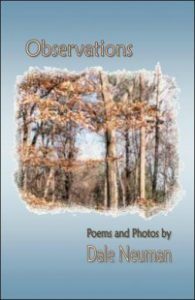 Precisely as the title implies, Observations is a poetic record of Dale Neuman’s perceptions as he observes and absorbs through the senses settings ranging from autumn leaves to ladies lunching in town. Undertones are benign, punctuated with peace and acceptance, and strengthened with an occasional complimentary photo. 45 pages; a gem to read on a quiet morning or as the sun sets. Seemed almost a form of play. You almost felt them there. Without some agenda to ply. Refreshed by their oasis of grace. Was to bring you luck instead of jail. Always moving on, never looking back. Creating awkward images sliding along the track. Moving us where we wanted to go. Or engineers to be seen as they smiled and waved. Brought to a contemplative state through the rays of sun, the sea, the vast reflections of the vertical sky across the horizontal plane of water: these are the subjects that inspire Dale Neuman to take his pen and camera all over the country, and to transform natural beauty through his mind and deliver it to the page in poem and picture. 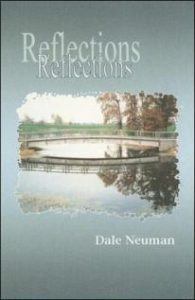 Reflections is a 45-page gem of sagacious serenity. As we slide through them silently. Both soothing and energizing to see. With the work of that day now done.